Help your children learn the numbers from 11 to 20 by repetition, fun games and challenges, and this collection of videos! This first stage is more about recognising the number words and being able to say them in the right order rather than associating them with a particular written number or number of objects. (Skip ahead to Counting on from 10 if that is what you are looking for). Remember, practice makes perfect! Counting to 20. Count fast, count slow, chant, sing! Making it active. Jump and count. Hop and count. Throw a ball and count. Count as you bounce up, and count as you bounce down! Making it fun. Count in turns - between pairs, groups or 3, or round in a bigger circle. Count backwards too. When you have counting to 20 under your belt, try counting backwards too! Play Snap Challenge. At random times during the day, call out "Snap Challenge! Count to 20 starting from 6!" Your child can snap challenge you, too. 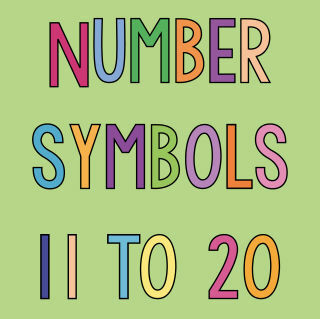 Here are some printables that you can use with the kids to help learn the numbers 11 to 20.